At Friday prayers today in Tehran, Ayatollah Khamenei backed Mahmoud Ahmadinejad and warned the opposition of a crackdown if protests continue. Iran’s supreme leader said Friday that the country’s disputed presidential vote had not been rigged, sternly warning protesters of a crackdown if they continue massive demonstrations demanding a new election. The speech created a stark choice for candidate Mir Hossein Mousavi and his supporters: Drop their demands for a new vote or take to the streets again in blatant defiance of the man endowed with virtually limitless powers under Iran’s constitution. Khamenei accused foreign media and Western countries of trying to create a political rift and stir up chaos in Iran. 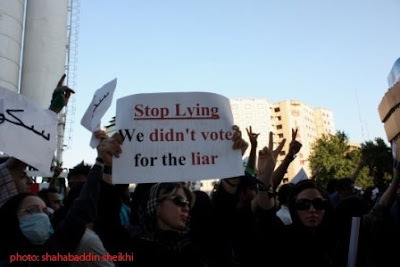 Khamenei said the 11 million votes that separated Ahmadinejad from his top opponent, Mousavi, were proof that fraud did not occur. Ahmadinejad watched the sermon from the front row. State television did not show Mousavi in attendance. Khamenei blamed the uprising on the “evil media belonging to Zionists” for seeking to show divisions between those who supported the Iranian state and those who did not. House GOP Conference Chairman Mike Pence (R-Ind.) and democrat Howard Berman (D-Calif.) introduced a strongly-worded resolution condemning the crackdown on pro-democracy activists in Iran. Word to Obama: The political unrest in Iran does not represent a dilemma: it presents an opportunity.